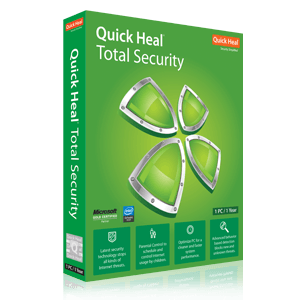 Quick Heal Total Security for secure online banking, smooth Internet surfing, and robust protection for your PC. Safe Banking protects your financial data during online banking and shopping. Parental Control lets you manage and control Internet and computer access for your kids. Enhanced Malware Protection blocks spyware, adware, keyloggers, and other malware. Ransomware Protection -The Anti-ransomware feature uses Quick Heal’s behavior-based detection technology that analyzes the behavior of programs in real time. This helps in detecting and blocking threats such as ransomware. As an added layer of protection, this feature also backs up your data in a secure location to help you restore your files in case of a ransomware attack. Web Security - Automatically detects unsafe and potentially dangerous websites, and prevents you from visiting them. Email Security - Efficiently blocks emails that might carry infected attachments or links to compromised or fake and phishing websites. Safe Banking - Protects your online banking activities from fraudulent websites and malicious programs that steal financial information. It provides a safe desktop session where your financial transactions on banking portals, shopping and other e-commerce websites stay private and hidden from hackers. Browser Sandbox - Runs your Internet browsers in a secure, virtual environment that acts like a shield between your PC's operating system and malicious downloads. If any malicious file gets downloaded in this environment, it gets secluded and is blocked from reaching your real PC. Application Control - to restrict from accessing applications such as gaming programs, messaging tools, media players, etc. Firewall - Firewall blocks external threats that try to reach your computer over the Internet. It also blocks threats that may arise within networks that are connected to your system. Besides allowing you to configure protection for incoming and outgoing Internet traffic, our enhanced Firewall lets you set a Firewall profile for network connections such as ‘Home’, ‘Work’, ‘Public’ or ‘Restricted’. Stealth Mode is an added benefit. It hides your PC from the prying eyes of hackers. Core Protection - Assures complete security for your PC with a deep system scan. A combination of features like AntiVirus, AntiSpyware, AntiMalware, Anti-Rootkit, Firewall and IDS/IPS work together to give you the best antivirus protection. Malware Protection - The existing Malware Protection of Quick Heal is now enhanced and offers more protection to your PC against spyware, adware, keyloggers, riskware, and other malicious programs. Quick Heal Remote Device Management (RDM) - This is a free portal where you can add your Quick Heal enabled device, view its current status, and get notified of any critical situation such as malware infections. You can also renew your subscription via the portal. Visit Quick Heal RDM here. PCTuner - Speed up your PC and boost its performance for resource-intensive tasks with PCTuner, a user-friendly PC optimization tool.